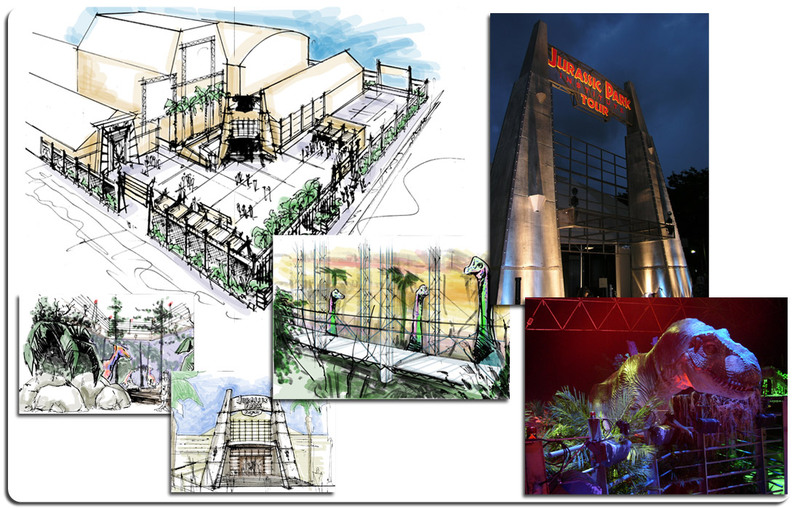 Prior to forming Modul8tion, Joe Cashman was Production Designer for the Thea Award winning “Jurassic Park Institute Tour,” a 50,000 sq. ft. traveling Educational Exhibit and Animatronic Dinosaur Show. Peter Menotti also served as Graphic Designer. Produced by Thinkwell Design for Nakashima International and Universal Entertainment. Art by Joe Cashman and Sevak Petrosian, Digitally Enhanced Pen and Ink. As you can see from the video below, this was an amazing undertaking. The final results are stunning. In this attraction, tour groups are led through various areas of Jurassic Park. The tour begins in the Welcome Center which replicates the Welcome Center from the movie, complete with a giant T-Rex skeleton. From there, the group is led into a theatre to see a movie about how dinosaur DNA is harvested and into a lab where eggs are incubating and hatching. The tour includes a stable, a veteranarian hospital and finally, the T-Rex encounter. The attraction included CGI, animatronics and live actors. Throughout each area, the illusion was maintained flawlessly and garnered Thea awards for the team. The Jurassic Park Institute is proof positive that there is nothing that Modul8tion can’t do. And while the overall concept is spectacular, it’s our attention to detail that enriches the experience and maintains the audience’s suspended disbelief throughout the tour. Would you like us to do the same for you? Call us and let us show you how we can turn your wildest dreams into solid reality. At Modul8tion, we see the big picture without missing the tiniest detail. Copyright ® 2016 Modul8tion. All rights reserved.